She's a disco diva, actress, Philadelphia native, and Distinguished Artist Award recipient in the 1998 Governor's Awards for the Arts – and she also makes a mean sesame chicken stir fry. 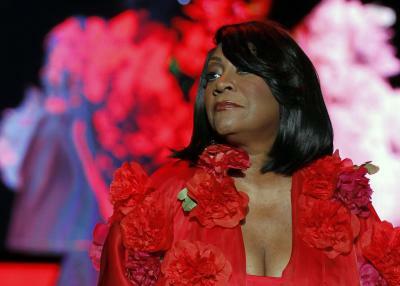 Patti LaBelle, born in 1944 as "Patricia Louise Holte-Edwards," grew up to the tune of accolades about her rich, soulful voice. She joined the Beulah Baptist Church choir at age 10 and sang her first solo at 12, all while listening to jazz and R&B on her own time. LaBelle's girl group, aptly named "Labelle," released the smash-hit "Lady Marmalade" in 1974, which shot up to No. 1 on the Billboard Hot 100 chart in early 1975. The just-can't-get-it-out-of-your-head, provocative French chorus – voulez-vous coucher avec moi, ce soir? – has been inciting liberated women (and men!) to shake their groove things at clubs and wedding receptions ever since. An equally sassy remake of the legendary song was released in 2001 featuring Christina Aguilera, Lil' Kim, Pink, and Mya, for the Moulin Rouge! soundtrack – it also reached No. 1 on the Billboard Hot 100 chart early that summer. If a scientific study ever takes place to prove that "Lady Marmalade" lowers a woman's dance threshold more dramatically than two vodka cranberries, America will not be surprised. LaBelle, of course, has a career that extends further than "Lady Marmalade." She has won oodles of Grammys for "Best Female R&B Vocal Performance" (seven) and "Best Traditional R&B Vocal Performance" (three), among others. She's the snappy, sassy voice of the former Oprah show theme song, "Get with the Program." A savvy businesswoman, LaBelle has also authored and released five cookbooks chock-full of down-home recipes and stories. She even appeared as a guest judge on Bravo's "Top Chef" in December 2011. This is where you come in, Erie. A well-cooked local meal is an art in and of itself. We've got our eyes on you already, Erie. We see you Facebooking and Instagramming your lunches and dinners like mad. We know that you can't wait to tell your friends that you're chowing down on kale chips freshly harvested from your CSA or finally spending an evening trying your hand at crafting your grandfather's chili or your grandma's legendary cobbler. This is your time to shine, O preachers of the arugula gospel – show us your flatbread pizzas topped with the spicy leaf and soft dollops of tangy goat cheese, or your abundant bowls of field greens doused in a zesty homemade vinaigrette. What we cook, what we create, what we serve, what we consume – it's all just another arm of the creative process. You don't have to be Julia Child. You just have to love that extra minute or two getting your kids' lunches ready to show them you care. Now's your time to shine, everyday food stylists and amateur chefs. You know that small thrill you get when you sauté something just right and you just have to capture the moment? We want to share in that joy. Instagram a photo of your prized home-cooked creation with hashtag #erieart or post it to the "2012 Governor's Awards for the Arts in PA" Facebook page and you could win an Erie Reader subscription ($50 value), a $40 LaBella gift certificate and family recipe compilation from Harry Miller, owner of La Bella Restaurant and Catering (priceless! ), two tickets to both the hot-hot-hot Governor's Awards for the Arts at the Warner and Aftermath after-party at the Erie Art Museum on September 20 (priceless! ).